My Bathroom, Forest Hills, Queens, October 1, 2005 - When we moved into our townhouse, it was a veritable Museum of Old Wallpaper. The house had striped wallpaper, solid wallpaper, spotted wallpaper, floral wallpaper, Chinese-themed toile wallpaper, fern-patterned wallpaper - and under the fern-patterned wallpaper, ancient moldy flocked wallpaper. Some of it was falling off on its own, some of it was stuck on with superglue. Just about all of it needed replacing. 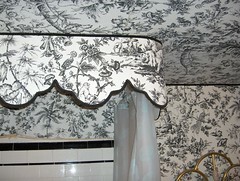 And not just the walls; oh, no, there was wallpaper on many a ceiling, too. We're lucky the woman who owned the place previously didn't wallpaper the floors (no, the beautiful hardwood floors were mostly covered with dirty wall-to-wall carpet, or - shudder - linoleum). Ever since we moved in, we've been systematically removing wallpaper, and let me tell you, it's tough dirty work. I hate wallpaper. And this room is just about the last of it. But we're not merely removing the wallpaper - we're removing the walls. We're having the entire room - and the bathroom directly above, and the kitchen directly below - gutted down to the studs. The last few months have been a whirlwind of faucet and tile shopping, and finally the actual work starts October 11 (which is coincidentally four years to the date from when we closed on the house). I don't think I'm ever actually going to be able to own a house, but I love the idea of being able to change the things you hate about one. It's great to be able to change what you don't like, as long as you ignore just how much it all costs!